1. Give your dishes kid-friendly names. For example, call the food Maria's Pixie Dust Noodles or Beautiful Butterfly Cheese Sandwiches. Some kids prefer names like Eyeball Soup or Greasy Hair Spaghetti. Whatever works and you're not too disgusted. 2. Find out what food your child's favorite sports person, super hero, or cartoon figure like and fix these especially for your child. Make a big deal out of it and take a picture of your child eating the extra special dish. 4. Cut everything up. Sandwiches, toast, cheese, fruit, veggies, and pancakes can be cut into triangles or interesting cookie cutter shapes. Ask your child what shape he wants his cheese in today; hearts or stars. Make the presentation on the plate look appetizing, and be sure one food doesn't touch another food! That bothers a lot of kids. You can even buy a new special "big boy" plate or "big girl" bowl. You never know, this could make the food on the plate look more interesting. 5. Kids like smoothies. Throw frozen strawberries or a berry blend, plus a banana and any other fresh fruit you want into the blender along with some milk or orange juice and 1/4 cup of cottage cheese. Let them help prepare their creation. 6. When eating out, let your picky eater try a bite of the food from your plate. If you take a bite of your entree and rate it from 1-10, your kids become curious and want to give your food their own rating. Usually if you rate it a 1 yuk, you get more takers than a 10 yummy. They see it as a fun dare. 7. Use the scarcity tactic. It works in sales and it can work at home. Make a new dish, but only just enough for the grown ups at the table. While you're all at the table, have the grown ups praise the new dish to each other. If the kids ask, tell them it's a new dish and "Sorry, but there's only enough here for me and Dad. I wish you could have some, but this is all there is." If you've done a good job, your children will be begging to try it. You can then happily share the small amount you made. Some of these tactics will work some of the time, but not all of them all of the time. What's important is that your attitude is light and you're not forcing them to eat. Try to stay positive and be a good food role model. 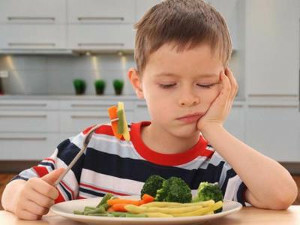 Eventually, although there are no guarantees, your child will slowly pass through their phase of picky eating. I thought my picky eater would never ever like more than 5 things (and 2 of them were pizza), but she did and is now a healthy and thriving teenager.